I've several books by Nita Leland and they are all very inspiring, books that you can refer to again and again, and it applies to this book as well. 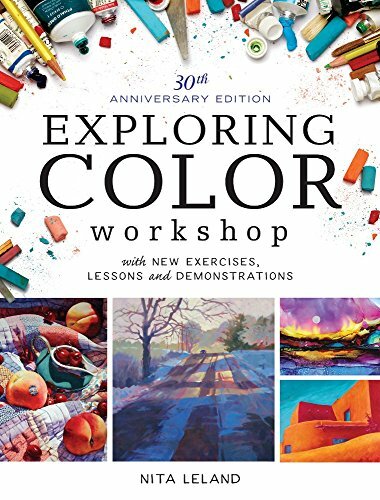 The first edition of Exploring Color published in 1998 had 144 pages and this updated edition has 176 pages. I did not have the original book but now that I have this, I find that there are similarities in this and her earlier book Confident Color: An Artist's Guide To Harmony, Contrast And Unity. Both book talk about colours. In Confident Color, it focuses more on the artistic side of using colours, while in Exploring Color it focuses on the technical aspects of colours. The similar parts are when talking about colour schemes, palettes and characteristics of colours. There's perhaps not much reason to get both books unless you really want to read more about colours. What's nice about this book is there are 75 hands on exercises that you can try on your own. These are short exercises designed to let you practice and understand specific concepts, such as mixing greens, mixing neutral colours, using particular colour schemes. Additionally, there are 8 step-by-step demonstrations. Examples featured throughout are also very beautiful. Overall, it's an insightful book on colours that's suitable for beginner and intermediate artists.